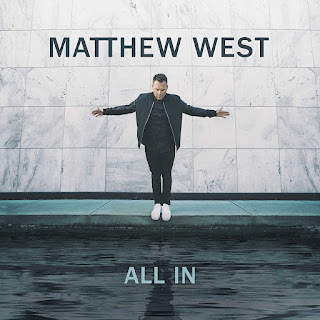 Matthew West wrote his new album All In with the goal of encouraging himself and his listeners to get up off the sidelines of our faith and really live it out – to go all in with our time, all in with our families, and all in battling the fears that may be holding us back from becoming all God made us to be. I really enjoyed this contemporary Christian music CD. It has catchy, upbeat tunes with lyrics that point towards a great God - a God who encourages, a God who strengthens, a God who saves, and a God who uses people in all walks of life. Quote from the song ALL IN: I step to the edge and I take a deep breath, I'm not turning back around 'cause there's no turning back now. I'm going all in. Quote from BROKEN THINGS: The pages of history, they tell me it's true, that it's never the perfect, it's always the ones with the scars that You use... If its true You use broken things, then here I am Lord, I am all Yours. Quote from MERCY IS A SONG: There is a light for every soul, no matter where you've been, just come on home, let all God's children sing along, Hallelujah, chains are gone. Mercy is a song. Quote from AMEN: Every time I look back over my shoulder, I can see the life He saved me from, Thank God. Quote from THE SOUND OF A LIFE CHANGING: I'm no Billy Graham, but I come as I am, and you know that you can too. I'm telling the world about amazing grace, telling the world about a God who saves, does anybody wanna feel alive today? Quote from THE BEAUTIFUL THINGS WE MISS: I don't wanna look back someday and find, everything that mattered was right in front of me this whole time. Open up my eyes Lord, keep me in the moment just like this, before the beautiful things we love, become the beautiful things we miss. Quote from YOU ARE KNOWN: To be known is to be loved, and to be loved is to belong, and you belong here in the arms that won't let go. Enter below to be included in a random drawing next Thursday night, September 28, 2017, at 8:00 p.m. Central Time. Only one entry per mailing address. Continental US only.